The HAUG charging bar ALS is suitable for most applications where material webs are to be fixed to each other. 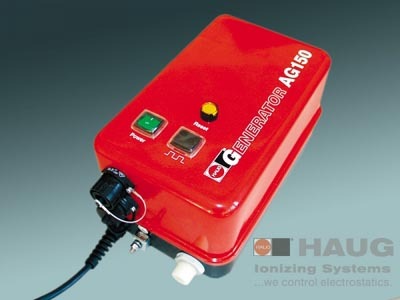 The supply to the charging bar ALS is from the charging generator AG 150 which is available with either positive or negative polarity. 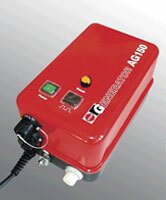 The direct voltage output of the charging generator can be set steplessly, and a remote option is also available. The charging bar ALS must be fixed at a distance of some 10–30 mm above the material to be charged, directly opposite a suitable counter-electrode. The charging bar ALS is available both with axial and a radial high-voltage cable connection. The high-voltage cable and the pin strip can be replaced easily. Electrostatic charges are applied using charging bars, electrodes or triodes which are supplied with positive or negative high-voltage from a steplessly adjustable charging generator. In order to charge two-dimensional or partial areas, bar-shaped electrodes or triodes are used. A resistance-coupled version for special requirements is also available. In order to ensure a continuous, reliable charging process, we strongly recommend discharging the materials to be bonded to each other using a suitable HAUG ionization system before charging.